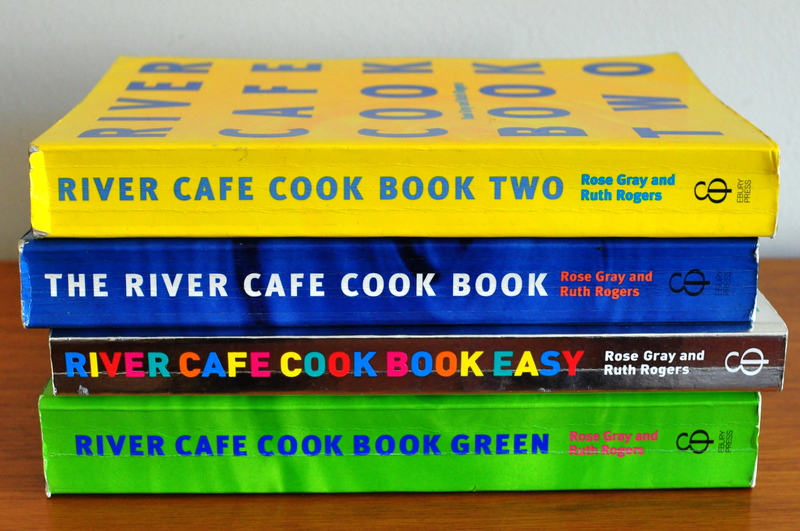 It wasn’t exactly fair that my first mention of the River Café Cook Books was about one recipe – the only recipe from these books until now – that didn’t turn out to be at least as good as I had anticipated. 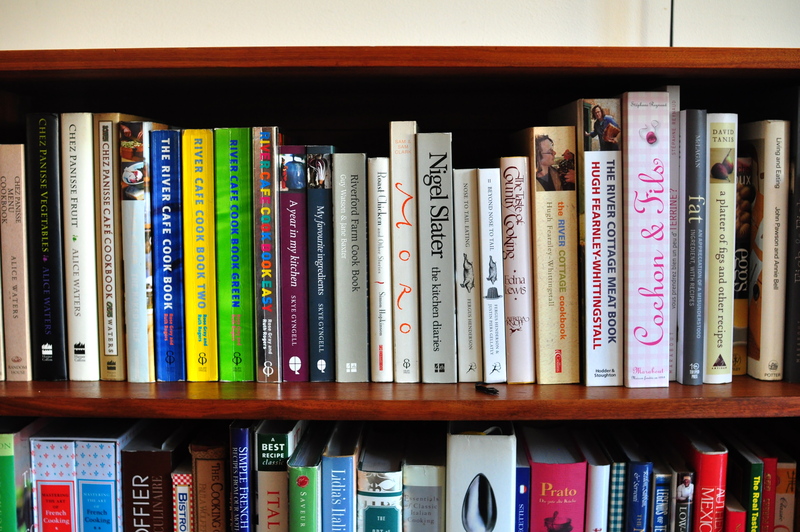 The truth is that these cookbooks have, more than anything else, inspired the way I cook. The River Café in question is the London restaurant created by Rose Gray and Ruth Rogers in 1987 as the employee cafeteria for Richard Roger’s architectural practice, which became a culinary phenomenon with far-reaching repercussions as its young chefs (Jamie Oliver, Hugh Fearnley-Whittingstall, Sam and Sam Clark, April Bloomfield, etc) created ripples of their own (and yes I do own cookbooks by all of them, well, except April Bloomfield who is currently working on hers). I acquired the Yellow River Café Cook Book in 1998, and the others since, and I have cooked many recipes from each of them, some of which many times. The biggest impact has possibly come from the chapter on wood-roasted vegetables (Riv Caf Yellow pp146-179). It includes a slew of recipes for carrots, beets, cherry tomatoes, asparagus, red onions, etc., which are tossed in a dressing of olive oil, vinegar, garlic, and herbs before being roasted in the oven. Frankly, I didn’t use to like cooked vegetables that much (salad is another story). But prepared this way, they become mouth-wateringly vibrant, exciting, completely delicious, and I seem to have lost the ability to make vegetables any other way – it may be time to revisit my repertory. The other big revelation was the Café cookbooks’ cakes, which are usually high in eggs and butter, gently sweet, and incredibly moist. I have yet to find one that I wouldn’t want to make again, and again, and again. In fact I feel bad for the dessert sections of my other cookbooks. For just a taste – and really I should include photos and descriptive notes – consider these: polenta, almond, and lemon cake (Blue p288); bitter chocolate toasted hazelnut torte (Yellow p322); pear, honey, and polenta cake (Green p356); the completely addictive pistachio and almond cake with lemon sugar syrup (Easy p240). But there are other recipes I cannot repeat often enough. The zucchini and prosciutto bruschetta with herbs and lemon zest (Green p270); a fig, buffalo mozzarella, and basil salad (Green p332); sea bass slashed and stuffed with herbs (Yellow p232); guinea fowl pan-roasted with milk and marjoram (Yellow p258); or the insanely time-intensive but completely-worth-it ribollita (Blue p36). And the wonderful thing is, there are plenty of recipes I still haven’t tried. This entry was posted on 10 March 2011 at 15:15 and is filed under Cookbooks. You can follow any responses to this entry through the RSS 2.0 feed. You can skip to the end and leave a response. Pinging is currently not allowed.